I am a call center agent. After literally having beer for breakfast one day, most of my office mates decided to go home at around noon. Already tipsy and sleepy, I was about to hitch a ride back home with a colleague when he and our boss decided to stay at the bar for a round of flirting with the honeys. Left with no choice, I stayed and joined in another round of inuman—as the reluctant wingman of the group. Everything else changed when we talked to our targets. My stress and weariness just disappeared. But then, swigging just a few bottles of beer, the girls started talking nonsense. I knew right there that the hook-up would end a failure. Expectedly, the girls soon left. My officemate was so upset he tried his luck on other girls inside the bar, which didn’t work as well. It was around 4PM already so we decided to go home. While driving along Commonwealth Avenue, bad luck again struck us—my officemate’s car overheated and stopped in the middle of the killer highway at rush hour! 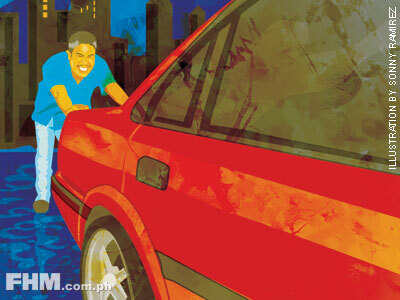 Left without a choice again, I ended pushing his car—drunk! Horrible. I believe we were really designed for failure that day. Sexbomb Shows Us How to Vote!